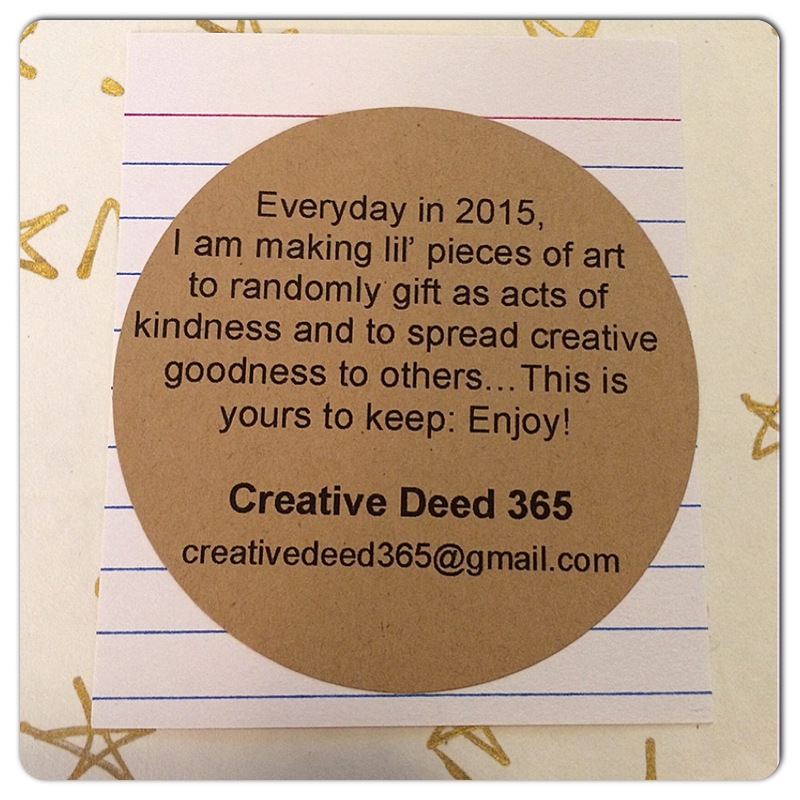 I am excited to introduce my new 365 Project for 2015… Creative Deed 365! Since 2013, I’ve completed two 365 projects with 730 pieces of daily art as part of my own creative daily practice. This year I am making small pieces of art (3 x 2.5) to randomly gift to others as acts of kindness and to spread creative goodness to others in the spirit of 6 Degrees of Creativity’s 2014 Creative Deed Project. I want to dedicate 2015 to sharing this process with others and give all the art away with year long positive messages of hope, inspiration, and possibility. 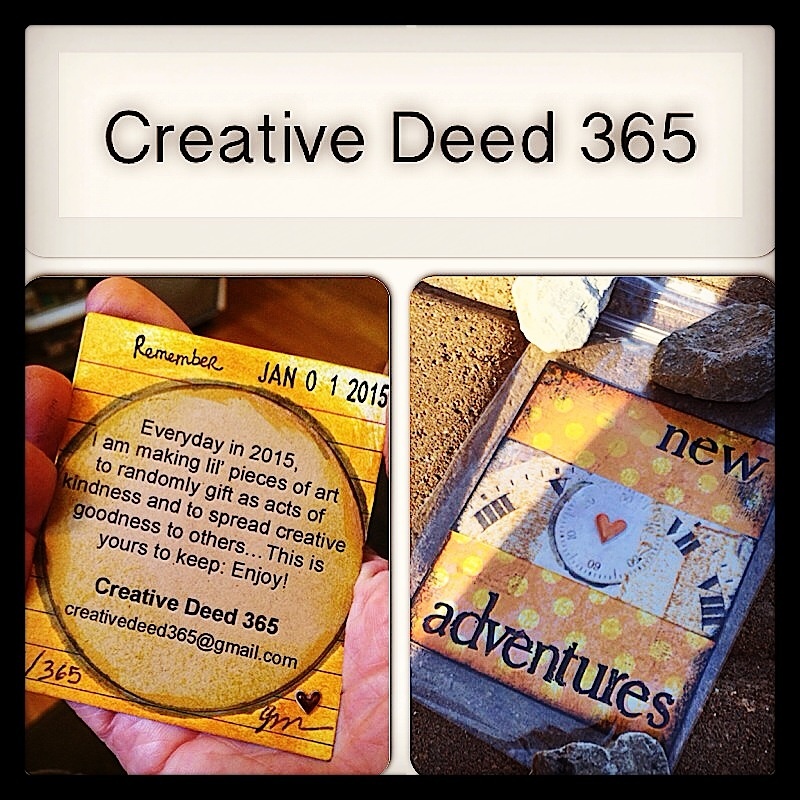 Make a request to join the Creative Deed 365 Group on Facebook to contribute your own art in the spirit of this project. I’d also love to send you some of my Creative Deed art sometime in 2015! If you’d like to receive a piece of this project sometime throughout the year, please send a mailing address to creativedeed365@gmail.com. You can make your Creative Deed art with whatever materials, media, and supplies you want! I am using mini index cards with a label on the back to briefly described the intention of the project. I’ve also purchased (at the local craft store) small ziploc bags to help safely protect the 365 art in the process of gifting to others– whether this be through the mail, outdoor or indoor places & spaces, etc. Here’s to new creative adventures starting! I can’t wait to see how this project unfolds and what develops throughout the year! This entry was posted on	January 1, 2015 at 3:29 pm	and is filed under 365 project, 6 degrees of creativity, collaboration, creativity, do something. Reblogged this on 6 Degrees of Creativity. I must get on WP more often because your blog prompts me to want to “art” more :-). Happy New Year to you. What a wonderful project. My art schedule is slammed for 2015 but I would love to leave art in places as a RAOK on a more ad hoc basis. Great idea. Thanks once more for the inspiration. I know its June, but can I still do this?